Coins.ph is the best way to pay bills, send money, and load your phone. It makes money transfer frictionless and accessible to everyone through the use of mobile devices and blockchain technology. Our wallet empowers consumers and small businesses by giving them direct access to world class financial services. 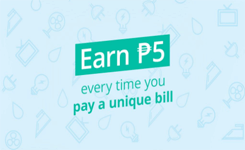 Get a ₱5 cashback every time you pay a unique bill with coins.ph. Over 80 billers to choose from! *A bill is considered unique if the billing account number has not been previously paid for using coins.ph in the current month. 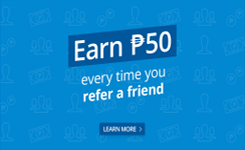 Earn Php 50 every time you refer a friend. Founded in 2014 by Silicon Valley entrepreneurs Ron Hose and Runar Petursson,Coins is Southeast Asia’s leading mobile blockchain-enabled platform that enables anyone, including those without bank accounts, to easily access financial services directly from their phone. Using Coins, customers have access to a mobile wallet and services such as remittances, air-time, bill payments, and online shopping at over 100,000 merchants who accept digital currency. Operating in the Philippines and Thailand, Coins’ mission is to increase financial inclusion by delivering financial services directly to people through their mobile phones. Inclusive / Create your wallet in minutes, no minimum cash-in amounts, and no monthly fees – we’re here to serve you. Convenient / Never stand in line again. Shop, buy phone load, pay bills, and send money to any major bank or remittance center – all from your phone. Safe and trusted / We are proud to be the leading and most trusted digital currency company in Southeast Asia. We use SSL connections, AES-225 Encryption and 2-Factor Authentication to secure your experience. Scale your business / Pay your suppliers and employees anywhere in the world. Automate your cash disbursals and never write another check again. Accept payments today / Start accepting payments in minutes. Leverage our merchant gateway to invoice customers and get paid, even if they aren’t Coins users. Make cheaper remittances / Remit money quickly at a fraction of the typical cost. Get remittances to their destination through our network of over 22,000 retail locations. Greater accountability / Unlike cash, every exchange conducted over the blockchain is recorded on a single, globally accessible ledger – providing an accurate, unmodifiable financial audit trail. Cost savings / The blockchain does not replace money or the existing financial system, it works with it. By providing a more efficient way to transfer value and reducing the reliance on cash, blockchain technology can save costs for government, banks, and end consumers. Spotlight on compliance / We take great care with KYC and AML. Since every transaction is electronically recorded, this allows for real-time, accurate analysis of transactions to prevent money laundering and other illicit activities.